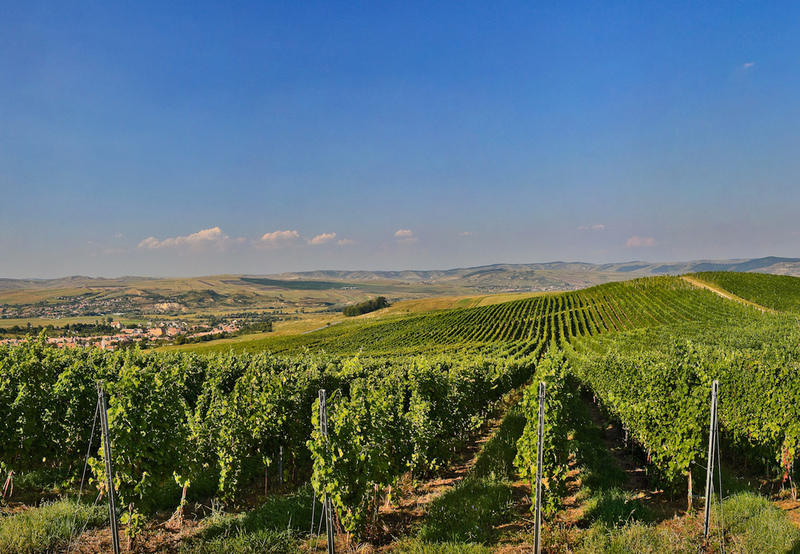 On the gentle hills of southern Transylvania, in the heart of what came to be known as "Weinland" or "Wine Country", lies Jidvei, an old Saxon settlement, and the vineyard of the same name, one of the most prestigious in the country. While the climate in the Tarnave Plateau is not especially warm, the local conditions in the Jidvei area favor the slow oxidation of the components in grapes preventing the accumulation of acids. Situated in Alba County, on the Tarnave’s Valley, Jidvei has been known for more than 700 years as a center of winemaking. Today, the vineyard and the wine factory in Jidvei region are producing top quality wines destined to the Romanian and international markets. Looking back at the history of winemaking, one could say without exaggerating that the history of Romania is almost as old as the noble art of making wine. Indeed, thousands of years ago, the Dacians, the ancient inhabitants of the lands that make present day Romania, were known for making quality wine, which they put in oak barrels and transported hundreds of kilometers to the ancient Greek colony of Tomis. From here, ships loaded the precious liquid and ferried it to the city-states of Greece and beyond. Perhaps that is the reason why Greeks believed that the god of wine, Dionysus, had his home in the lands around the Danube. The ancient Greek historian Herodotus talked about the areas in Dacia north of the Carpathian Mountains, calling its inhabitants crafty winemakers. In the 13th century, the Saxons, German colonists that settled throughout Transylvania, arrived in the Jidvei area, bringing with them clones of the grape vine varieties in their homelands. This explains why Jidvei is considered the second motherland of the famous German Traminer wine. In terms of production, the country is one of the world’s largest winemakers, consistently ranking among the top 10 wine producers in the world, and one of the first in Europe. Both internal consumption and exports have been growing steadily over the last few years, with consumption of noble vintages increasing 15% on average on a yearly basis. The negative influence that the communist period had on winemaking is still felt to this day, but the last few years have witnessed the emergence of a number of small producers of quality wines, that are slowly changing the perception of Romanian wines in the world. Since the territory that is now Alba County was even back then an established province of ancient Dacia, it comes as no surprise that winemaking remains a strong tradition with extremely deep roots. Numerous archaeological discoveries bear testimony to just how important wine was back in the time, the most spectacular of them being the altar dedicated to the god Silvanus, protector of agriculture and viticulture. The history of winemaking in today’s Wine Country ('Weinland' in German or 'Tara Vinului in Romanian') – the collective name given to the vineyards of the Alba area – is long and well documented, displaying an active involvement of authority figures in its development and extension. A decision issued in 1238 by the Catholic Episcopate of Transylvania – which had established its headquarter in Alba Iulia – pronounced tax exemptions for German colonists specifically for the grapes they grew and the wines they sold. Some ten years later a similar measure was taken for the Saxon settlers of the region. Historians argue that the Saxons might have brought significant improvements to this occupation by introducing more advanced technologies and, again, new varieties of grapes. The quality of the wines produced in this area was already well established by the XVII century, as proved by the complimentary description offered by Martin Opitz, a professor at the People’s Academy of Alba Iulia, who was particularly impressed by certain varieties such as Feteasca Alba, Italian Riesling, Furmint, Sauvignon Blanc, Grasa de Cotnari, Muscat Ottonel, Traminer, and Pinot Gris. It’s not a coincidence that all of these fall under the umbrella of “white wines”, as the natural conditions seem to be especially favorable to the cultivation of white grape varieties. The entire Alba County is included in the Assembly of European Wine-Producing Regions, but even among the many well known wine cellars of the region the one that stands out the most is Jidvei, property of the company “Jidvei” Limited. In addition to its over 1,000 hectares of vineyards providing the raw material for some of the best known dry and medium-dry wines of Romania, the company also owns the castle at Cetatea de Balta, a nearby historical monument and tourist attraction that can only add to the charm of a wine tasting experience. Also worthy of note is the “Strugurele de Aur” Folklore Festival organized every year in the second half of September in the Jidvei village, which promotes traditional folk music and, to a lesser extent, local wines, bringing together artists and wine aficionados from all over Romania. While Jidvei is not a particularly warm area, the climate of the Tarnava Plateau favors the slow oxidation of the components in grapes, which produces a relatively slow accumulation of sugars and preserves the grapes acidity. The Jidvei vineyards occupy about 2000 hectares of hilly terrain, with mostly southern exposure. The Jidvei winery was established as an industrial winemaking center in the 1950s, and privatized in 1999. Following privatization, the winery developed tremendously, now exporting much of its production. The winery makes several collections of wines, such as Castel, Tezaur, Grigorescu, Clasic, and Nec Plus Ultra. Some of the best wines for which Jidvei is known for are Pinot Gris, Dry Muscat, Gewürztraminer, Feteasca Alba, Dry Riesling, Chardonnay, and Sauvignon Blanc. The Jidvei winery is known as the second home of the renowned German wine Traminer, brought by the Saxon colonists that settled throughout Transylvania. The Jidvei winery exports much of its production, and specializes in white wines, as well as a very appreciated sparkling wine. Wine tasting sessions are organized in the beautifully restored Bethlen Castle nearby Jidvei, built in the 16th century. The Jidvei winery has an extensive wine collection, including many limited series wine that make excellent souvenirs. Every year, the Jidvei winery contributes to the organization of a national traditional folk music festival called the Golden Grape. Located nearby Jidvei, Cetatea de Balta (The Citadel of the Pond), was for centuries a major center of political power in Transylvania. One of the best preserved monuments is the Bethlen Castle, also known as Haller Castle, after the name of its last owner. The edifice, erected between 1580 and 1590 in the French Renaissance style and rebuilt in 1615-1624 in the Baroque style is well preserved and now serves as a space for wine tasting for the Jidvei winery. For years, the castle was used to store champagnes, but the castle has been beautifully restored in recent years. A number of original elements, such as the old wooden stairs from the 16th century, are still preserved. There are several fortified churches in the area around Jidvei, the oldest being built in the 13th century. Like other examples throughout Transylvania, the fortified churches in the Tarnave Plateau had large walls, towers, and moats to protect them from the attacks of invading Turks and Tatars. Read more about the Weinland" / "Wine Country"